Lions and tigers and bears (oh my!)... It's my guess that you'd agree with Dorothy on this one. There are some critters you just don't want to invite into your landscape. Lions, tigers and bears are probably right at the top of your "keep out" list, closely followed by some more likely interlopers such as deer and coyotes. I'll have some ideas for turning away unwanted visitors in a future column. But today I want to talk about ways to attract wildlife guests that are both beautiful and beneficial: birds, bats and butterflies! Sorry about all those B's! Let's start with birds. Providing bird houses and bird feeders is a fairly obvious way to attract a bunch of feathered friends. When it comes to bird houses, there are literally hundreds of styles for you to choose from. But not all of them are actually practical for birds to use and are sold primarily to be ornamental. Ideas for building your own birdhouse are available at the Virginia Department of Inland Game and Fisheries. 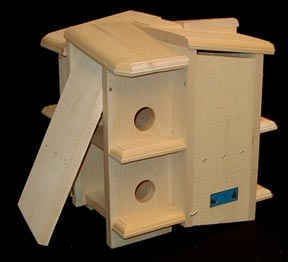 Plus - here is an article on how and where to find free birdhouse plans. Another important consideration will be drainage and ventilation. Baby birds can drown unless any accumulated rainwater can drain away; and adequate ventilation will allow air to flow through on hot days. If you're planning to put up a bird feeder, it's a good idea to position it early in the season and then keep it stocked throughout the winter, so that birds become accustomed to visiting you, confident that they'll find a plentiful supply of goodies. Again, the birding.about site has some free easy- to-build plans for making your own bird feeder if you're looking for a little building project! The sight and sound of hummingbirds is particularly delightful. As well as hanging and filling some hummingbird feeders, you can plant shrubs that naturally attract the little buzzers to your neck of the woods. From birds to bats. I know some people have an aversion to bats, but I can assure you that really they pose no tangible danger to you. What CAN be dangerous are those pesky mosquitoes, and the good news is that a single bat can catch and eat literally thousands of mosquitoes in a single night. Install a couple of bat houses and next summer you should find yourself spending less time scratching mosquito bites! Regular readers know that I'm a big fan of butterfly houses. Not only are they attractive structures, but they provide a "home base" for butterflies to remain in my vicinity. I find butterflies to be a particularly relaxing sight as they flutter silently around my garden, and I make sure that the houses are placed close to some Buddleia, otherwise known as butterfly bushes. Once again, you can find more detailed information about Buddleia and other butterfly garden plants at my web site, or send me an e-mail and I'll send you the direct link. Anytime is a good time to be planting to attract the wildlife you're happy to entertain as guests in your landscape. Add housing and feeders and you'll find you'll have plenty of happy "tenants" all year long!